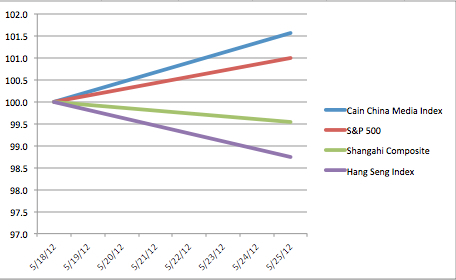 The Cain China Media Index (CCMI) gained nearly 1.6 percent last week, outpacing the S&P 500, Shenzhen and Shanghai indices during a mixed week in the global equity markets. China’s major Youtube lookalikes Youku (YOKU) and Tudou (TUDO) led the index with 20 percent and 18 percent respective gains on news of Tudou’s stellar first quarter results. The two companies are in the process of merging, and with Tudou’s scorching 77 percent Q1 revenue increase and narrowing losses, investors jumped in to drive the stock to its best weekly performance since early March. 5 of the 6 online media stocks in the CCMI gained ground last week. In addition to YOKU and TUDO, Phoenix New Media (FENG) also performed extremely well, posting a 9 percent gain as it beat analyst estimates with Q1 earnings of 7 cents per share. Motion picture stocks fell by an average of 2.2 percent for the week, with only the small cap Taomee (TAOM) managing to eke out a gain. All 3 of the index’s broadcasting & cable stocks also fell, while advertising and game stocks managed modest gains. In all, decliners outnumbered gainers 10 to 9 (with one stock, Shanda Games, flat for the week). However, stocks trading on the U.S. NYSE and NASDAQ exchanges were mostly gainers (8 to 3), while all but one of the index stocks trading on the Chinese Shanghai and Shenzhen exchanges declined. Tudou and Youku may be good buys at this stage, with both stocks having broken above their 50 day moving averages with convincing volume. There had been skepticism in the market about the two companies’ ability to contain costs and turn profitable, but these concerns now look to have been laid to rest. 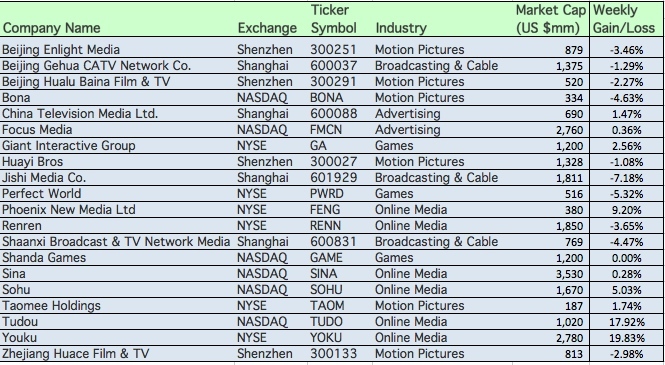 This entry was posted in Analysis and tagged Cain China Media Index, CCMI, Chinese broadcasting & cable stocks, Chinese game stocks, Chinese motion picture stocks, Chinese online media stocks, NASDAQ, NYSE, Phoenix New Media, Rob Cain, Robert Cain, Shanghai stock exchange, Shenzhen Stock Exchange, tudou, youku by chinafilmbiz. Bookmark the permalink.